Being a caretaker was a lot like being a first time mom. On the outset, I kind of thought caretaking would come naturally and I had rosy expectations of how wonderful this would be. It would be a special time of growth for our family. Sure there would be hard times, but it would be so meaningful that we wouldn’t hardly notice the inconveniences. In reality, it wasn’t as idealistic as I had imagined. I wasn’t as patient or good natured as I’d imagined. Much of the time I was tired, overwhelmed, and didn’t know what I was doing. Our life revolved around Glenna’s care – we even slept with a baby monitor for the times she needed help in the middle of the night. All of our energy was being funneled into surviving. Half the time the kids homework didn’t get done and we were constantly bailing on any plans we made. Just like life with a newborn, keeping everyone alive for another day was considered a success. There was one glaring exception though where it wasn’t like having a baby at all. When you have a baby the future is filled with the hope of milestones and the promise that things will get better, but when you’re caring for someone with a terminal illness the future is harder to look forward to. However distant or imminent, the decline will come and things will get harder. In retrospect I feel a little guilty about how difficult it was for me. Glenna was truly a gem to care for. She was rarely grumpy or demanding. For the most part, she was extremely upbeat and did everything she could to not be a burden. But still, it was hard. Because her cancer, at least in her lungs, was shrinking, but her overall health was declining it was sometimes hard to know what to hope for. When Noel or I would take her to appointments, we would always return extremely frustrated. At the onset, the oncologist team was extremely encouraging. They told us her lungs were improving and the rest of her health would follow. We just needed to wait and she would turn the proverbial corner. So we waited. 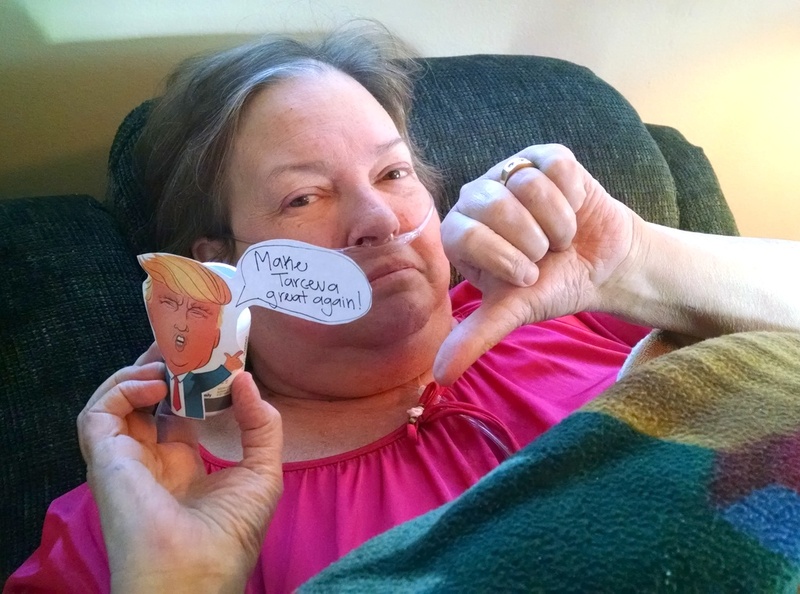 As the appointments went on, Glenna would be buoyed by the news that her lungs were looking better and we would be frustrated because it didn’t feel like we were rounding that corner. Noel and I would stay up hours later than we should have, debating whether we were just having bad attitudes or whether we were the only people who really saw what was happening. It was frustrating to watch her suffer and we often felt helpless. Many days it felt like she was in limbo, neither making strides to improve nor decline. There was no clear direction on whether we should we be pouring optimism into the hope for a cure or preparing ourselves for the worst. The emotional flip-flopping was exhausting and with no end in sight we worried about our ability to continue indefinitely as her caretakers. Some dark humor on inauguration day. Glenna often joked that she wanted her obituary to say given the choice of a Trump presidency or death, she chose the latter. Family changed their lives around to arrive within the next few days and soon our house was filled with her sisters and daughters. Glenna’s paranoia kept mounting. She was afraid of falling asleep and was sure that we were involved in some sort of a shady business scheme. Hospice had us try a couple of different anxiety meds to try and calm her down, but they all seemed to have a paradoxical effect where they actually made her more paranoid and anxious. The final night she spent at our house they tried the last anxiety med in their arsenal. It’s hard to say whether she had a worse reaction to this drug or whether the sleep deprivation had built up to an unbearable point, but her paranoia that been mounting in the preceding days reached its pinnacle that night. We decided to split the night up into shifts. Danielle would take the first shift, I would take the middle of the night shift, and Noel would take the early morning shift. I can’t hardly find the words to explain that night, but Glenna was out of her mind with fear and paranoia. She acted like we were holding her hostage and kept trying to escape. Towards morning, when the anxiety med should have worn off, she refused to take her medicines from us and wouldn’t hardly let us come near her. Her strength had diminished in the previous weeks, but in her bewildered state she was stronger. It was the worst night of my life to date. Worse than any of the nights Cooper had night terrors. When Noel woke up for his shift, he called the nurse hotline and they sent a nurse over immediately. Based on our inability to stay on top of her pain meds and the fact that she had no idea where she was (when asked, she said she was in Provo on the BYU campus – a school she never attended), the nurse told us she strongly recommended a transfer to their inpatient facility. In my heart, I knew if Glenna left our house she would never come back. The last time she’d been hospitalized there had been a moment as we were waiting for the ambulance. She’d turned to me and asked, “I can come back, right?” Her face had this vulnerable, pleading look and my heart almost broke. I kept picturing her face in that moment and felt like I would be betraying her if I let them take her away. I felt like a child and wanted someone to tell me what was right. In tears, I called called her sister, Marsha. Marsha said they would be right over, but that this needed to be our decision. Fortunately, Danielle and Noel were much calmer and more objective and realized that we really didn’t have a choice. 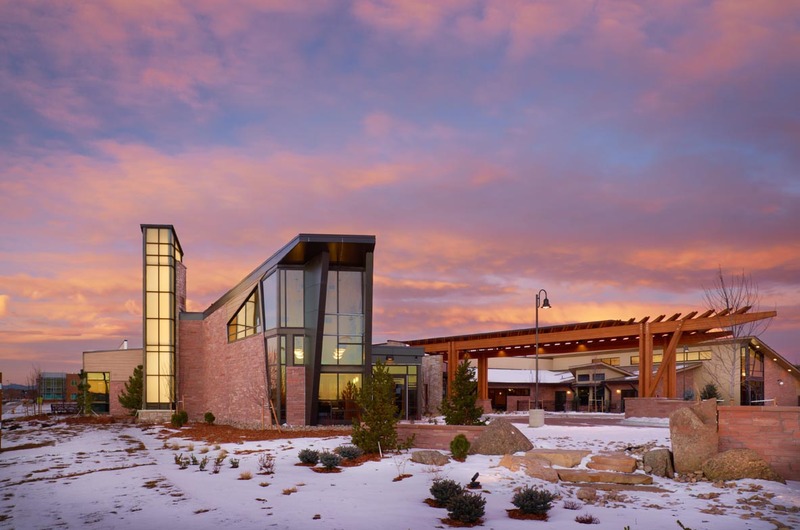 The Denver Hospice. Courtesy of their website. I pulled myself together and arranged for a friend to pick up the kids and take them to church while we figured things out. The transport ambulance came to pickup Glenna. Noel and I followed in our car. The family gave us a head start to take care of paperwork and get her settled, kindly cleaning up our house while we were away. The whole ride over I still felt torn up inside about what was happening, but the second I arrived at hospice I felt my anxiety fall away. There was a special spirit there. When we walked into Glenna’s room she was dressed in a white nightgown and sleeping peacefully for the first time in days, maybe even weeks. When we asked what they’d given her, they said all they’d done was give her a dose of pain medicine through an IV and she’d relaxed. I may never know for sure, but part of me wonders if in all of her trying not to be burden, she just couldn’t allow herself to pass away in our home. After filling out all the paperwork and talking with the hospice doctor, Noel and I had some time to sit in Glenna’s room while we waited for family to arrive. Noel too said he’d felt a peace when we entered the building. It was peace that neither of us had felt in months. It would still be six more days before Glenna passed away, but from that point on, we both just knew that everything was going to be okay. What a heartbreaking experience. I am in tears reading this. Cancer is a horrendous disease. I wish no one had to suffer from it or watch their loved ones suffer through it. Lots of prayers sent your way. Wow, what a challenging experience (it sounds so trite to say that, but I’m ​lacking any better words, I apologize). I think there are times when we go into experiences, with a vague idea, but not really understanding what it will be like (parenting, mission, childbirth, caretaking). And sometimes it is so much harder than we could have ever imagined, and if we’d known how hard it would truly be, we’d probably never have volunteered for it, and yet, what we gain from it is invaluable. And we sometimes look back and wonder how on earth we did that.